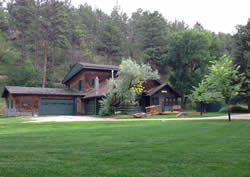 Black Hills Vacation Homes web site, a regional directory listing the rental cabins, lodges, vacation homes and other accommodations in the Black Hills area of South Dakota. 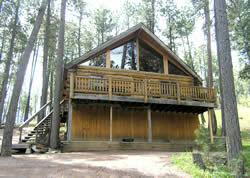 Includes cabins, resorts, lodges and places to stay while vacationing at Custer State Park, Mt. Rushmore, Crazy Horse Mountain, Sturgis Bike Week, Deadwood casinos and other attractions throughout the Black Hills. We welcome you to our fully furnished and well supplied 4 bedroom vacation rental home. This tastefully decorated house is not your basic cabin in the woods. It has an all stone exterior and several lovely stone features inside. With all the comforts of home and the unique décor it will be the perfect vacation experience for a family get together or a group of friends. It can accommodate 10 – 12 people with plenty of space for all. There is close access to ATV, hiking and biking trails. The central location of the house is perfect for visiting all the main attractions of the Black Hills. We also have several lodging room that can accommodate 2-4 people per room. Please visit our website for more information. 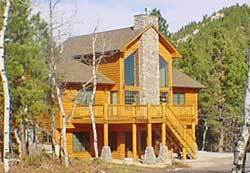 Contact Executive Lodging of the Black Hills for the most exclusive vacation rentals in the Black Hills. Our lodging cabins and upscale vacation home rentals are perfect for vacations, business retreats, religious retreats, weddings/receptions, youth groups, family reunions, parties and holiday gatherings. High Country Guest Ranch is centrally located in the Black Hills and combines the secluded wilderness with many modern comforts. We offer a variety of beautiful cabins from fully furnished vacation homes to authentic log cabins and camper cabins. Our place will make you feel right at home while allowing you to experience the excitement of the outdoors. Also, the new location for Circle B Chuckwagon & Cowboy Music Show. Please see our website for more information. Deadwood Connections is your Connection to the Black Hills. Our cabins are located in the Northern Black Hills, near historic Deadwood. Make your vacation a memorable one with one of our beautiful fully furnished Black Hills vacation rentals, including some that are pet-friendly. All our homes are Smoking Free for your convenience. Real Log Executive Silver Mountain Lodge/ Real Log Homes Cabins with full bathrooms. From 2 to 12 people we can provide. Family reunions are welcome. 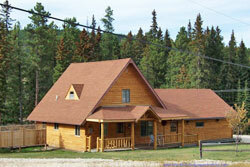 Each LOG HOME/ Large Homes has Full Kitchens, TV, Heat & A/C, Microwave, large Coffee pot. Linens, Dishes, Silverware, Pots/ Pans and Utensils. Charcoal grills at each cabin. 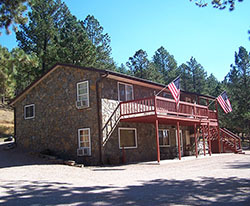 Fire Pit area, Laundry facilities, Wi-Fi, Small playground and Hiking Trail behind cabin areas. Pavilion area. Motorcycle parking can also be under pavilion area. Locally Family Owned and Operated. LOCATION: 6 miles to Mt. Rushmore, 4 miles to Keystone, 12 miles to Rapid City & Hill City. 8 miles to Reptile Gardens and Bear Country. 15 miles to Needles Hwy. Welcome to scenic Black Hills of South Dakota and the Black Hills Vacation Homes web site, your complete guide to vacation home rentals, lodges, resorts and other places to stay while vacationing in Black Hills of South Dakota! Your travel and vacation plans come alive when you enter this majestic state with its numerous attractions, entertainment and events, including restaurants, motels, lodging, camping, shopping, gift shops, and services. These attractions include the awe-inspiring Mount Rushmore and the magnificent carving of Crazy Horse. Any time is a good time to take a trip through Custer State Park, in the heart of the Black Hills (where the buffalo roam) or the unique beauty of the Badlands. Also, experience the nonstop gaming fun of Deadwood gambling or Sturgis Rally, where motorcycles rule during August, time of the world famous Sturgis motorcycle rally. Whatever your vacation pleasure, Black Hills Vacation Homes web site will provide you with information on where to go and what to do to make your vacation a wonderful event. Happy vacationing in South Dakota!